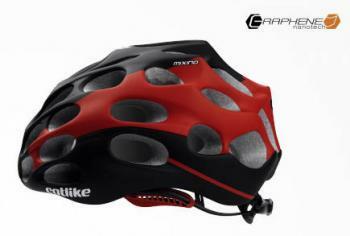 A Spanish sports equipment company called Catlike uses graphene to produce cycling helmets, in a line called Mixino 2014. The company states that graphene allows improving the helmet's safety features, as well as reaching minimum volume and weight and increase ventilation. The Mixino helmet has a robust inner skeleton, made in the shape of an aramid skeleton (Aramid Roll Cage) which has been treated with graphene in its polymer matrix. This increases the entire mechanical performance and improves impact energy absorption. The Mixino line includes several models, among them Mixino Road, Mixino MTB, Mixino VD2.0 and more.